What Happened to Goodbye | What YA Reading? Sarah Dessen, for all of her grand reputation in the realm of YA fiction, has never been an author I’ve felt particularly inclined to read. Say what you will about my approach to contemporary novels, but as of yet my expectations have been completely and utterly satisfied with the assorted works John Green, as well as the occasional indulgence in a romance à la Jennifer E. Smith. And in this topsy turvy world where even Veronica Roth, acclaimed author of my current least favourite book, Allegiant, disappoints, why mess with a perfectly good thing? All of this changed, however, during a distinctively pivotal moment of my life at Target last weekend. To my growing exhilaration, I discovered that What Happened to Goodbye was a whopping 20% off the cover price. Needless to say, I purchased it immediately. And never looked back. I, for one, thoroughly enjoyed the (negligible) role the romance played in this novel. Although What Happened to Goodbye‘s synopsis heralds Dave as love interest extraordinaire, he spent the majority of the book squarely in the friend zone. Which was, to be honest, a breath of much-needed fresh air. As much as I enjoy a swoon-worthy romance– and from what I’ve heard, Sarah Dessen is queen of swoon-worthy romances– I appreciated this realistic break from YA fiction’s rampant hormones. Really, What Happened to Goodbye‘s plot as a whole is really rather low-key. There’s no nail-biting suspense, no larger than life conflict, no epic cat fights between sworn frenemies. Even the climax is more of an anti-climax than anything else. And although this made for a very serene sort of read, and although What Happened to Goodbye is far from being Dessen’s most hailed book, I expected more. Because plot-wise, it wasn’t that far a cry from dull. That being said, the plot– or lack thereof– left ample room for expertly crafted relationships between characters as well as skillful scenes of introspection. 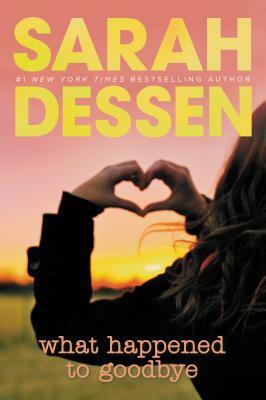 Kudos, Dessen. Kudos. All in all, saying goodbye to this novel wasn’t nearly as hard as I thought it would be. Oh, well. I’m sure we’ll meet again, Sarah Dessen. 3.2/5 stars.